This salad is one of my favorites because it captures all sorts of tastes and textures - sweet, salty, sour, creamy, crunchy, etc. 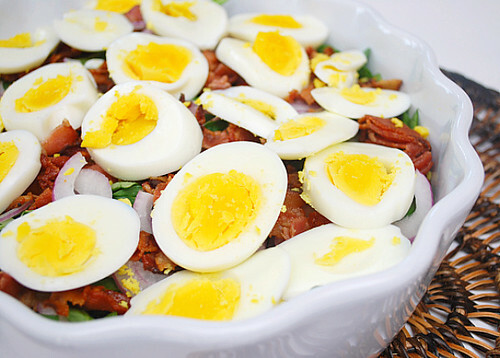 It's a simple spinach salad of baby spinach, crisp bacon, sweet red onions, hard boiled eggs, sliced mushrooms and tying it all together is a sweet and sour dressing made with red wine vinegar and rendered bacon fat in place of olive oil. For an added punch of flavor, you could add some crumbled blue cheese (which I did add to leftovers - yum!). Fry the bacon and remove to a paper towel to drain, reserving 3 tablespoons of the rendered fat. Crumble the bacon and set aside. Transfer the bacon fat to a small saucepan set over low heat and whisk in the red wine vinegar, sugar and Dijon mustard. Season with a small pinch each of kosher salt and black pepper to taste. Place the spinach, mushrooms and the sliced onions to a serving bowl and toss. Add the dressing and bacon and toss to combine. Season with pepper, as desired. Serve immediately and garnish with slices of egg. yum. i was just thinking about what to do with some bacon in the fridge for my dinner tonight. Classic. I especially love the bright pop of the yolks in your photo. This looks fabulous! Love all the colors and I've been wanting to try a bacon vinaigrette!